Gates allow for both the protection of a railing and the ease of an open passage; perfect for secluding sections of your yard or deck without sealing off a useful path. Cable Railing Direct makes custom gates for any customer interested in integrating one into their system. Select the material option that best matches the rest of your railing and complete your order. We will contact you later for the dimensions and any other details specific to your project. Each gate is made through combining our standard straight and corner frame pieces into a seamless square. This square is them filled in with the same cable & fittings used in the rest of your system, all swaged, attached, and tensioned by our professionals in-shop. The completed gate is then shipping to you ready to be attached to your railing. Each gate comes with complimentary components, such as hinges and latches. The specific items included with the gate depends on which gate you choose. 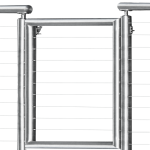 If you haven’t yet chosen your posts and top rail, but know you want one of our custom cable gates, we suggest selecting a full ALUMINUM or ROUND STAINLESS STEEL system for a perfectly matching end result. 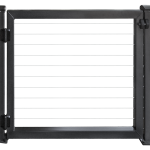 Note that our Aluminum Systems/Gates are available in five color options: black, bronze, natural, clay, and white.